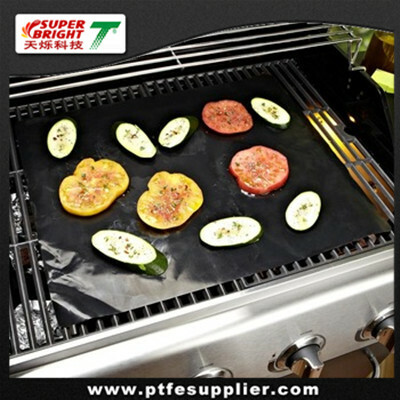 The PTFE Oven Liner is not only a convenient product, but also a very important cooking device that promotes healthier eating. It reduces calories because the liner enables you to cook without adding other fat or grease. 1. PTFE Oven Liner can be used to protect the bottom of the microwave/ oven/grill/pan/pot/frying pan ,etc. against splashes, messy drips, fat, burn-on sugar & oven messes, keep your utensils clean. 2. Suitable for all kinds of ovens, does not slide away in the ovens. 3. Made of PTFE coated glassfiber, excellent anti-adhesive, you can easily remove surface grease, stains with soapy water; can be used repeatedly. 4. Prevent stains overflowed onto the bottom of the oven in the baking process. 5. High temperature resistance, continuous operating temp from -60~260°C. 6. Non-toxic, safe for use in the dishwasher, could directly be in contact with the food, and anti-corrosion features. 7. Customized packaging and sizes are welcome, can be cut with scissors to fit the size and shape required. PTFE Oven Liner with a100%non-stick surface you days of scrubbing the oven floor are definitely over. The PTFE Oven Liner can be used for years on either side. 1).Avoid using metal, sharp or pointed objects on the non stick oven liner, they might damage the liner. 2).Do not put the oven liner in direct contact with flames, burners, grill or heating elements. 3).Do not cover ventilation holes of the oven (gas oven).